Jacq told the public and the media how Franco treated her and her mother and how he killed Samuel. Jacq admitted that she loves him, but she can not stay quiet any longer. Franco was wondering why Jacq had done such a thing. She was full of rage that he wanted to hunt down Samuel. Jacq was hurt for doing it to her own father. She also told Gabriel how scared she is for their lives and how worried she is for her mother. Gabriel told her to wait for a little more time. What they did is still not enough to bring down Franco. He plans to go back to Salvacion and find more evidence against Franco. Franco asked Isabelle to clean up his name for the people. Isabelle finally learned from Cindy that Natalia moved away because of her father. She got worried and promised herself to also find some evidence against Franco. She decided to use Franco’s love against him. She told Franco that she is now giving up her fight against him and she submits herself to him but told him to make sure their daughters are safe. Tessa seemed to be unconvinced. Gabriel got ready to go to finally have an edge against Franco. Jacq wanted to go with him despite the danger. He told her that she is his inspiration to end Franco’s terror. They arrived in Salvacion. Gabriel had sadness in his eyes which caught his better half’s attention. He explained how Franco terrorized the place and how his father, Samuel, had loved their province. The couple surprised an old man who had thought they are Samuel and Isabelle. People had warmly welcomed them. Gabriel asked them about the land his father had given them. The people told them that they had to submit to everything Franco wanted including giving up their lands to him. They promised Gabriel their help to bring down Franco. Gabriel and Jacq also found the coast guard officer who did the investigation on the sunken ship. The people had contacted the media to bring out Franco’s evil doings in their homeland. They also found a witness about the sunk ship. Franco finally found out where Gabriel is. 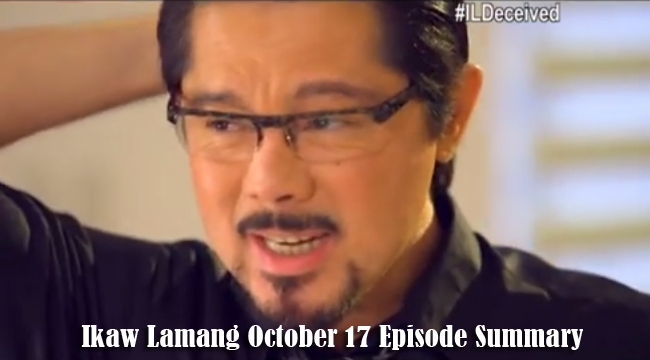 Will Isabelle really help to clean Franco’s name? Will Jacq and Gabriel finally get enough evidence? Will Franco get the last laugh? Read all other Episode Summary of Ikaw Lamang here.